Hockwold Hall in Hockwold, near Thetford, Norfolk sleeps 26 people. 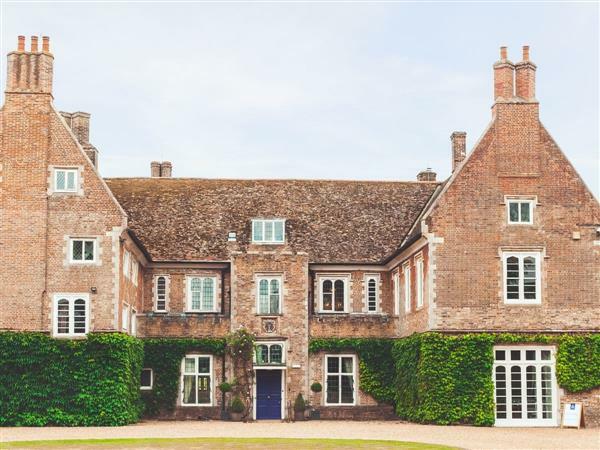 Hockwold Hall near Thetford offers guests a rare opportunity to experience a real slice of history in a luxurious setting and is perfect for those wishing to host a celebration to remember. This property is the perfect location to celebrate your special day, as there is even a ceremony room available to hire. It is hard to describe the feeling that you get when you turn the corner on the winding driveway and see Hockwold Hall for the first time, but it is easy to see why it has hosted so many events for A-List celebrities. The wow factor is immediate, but step inside and you will find that this feeling continues as you explore this beautifully appointed former royal residence of Prince Victor Duleep Singh. A Tudor mansion, built by a local magnate, Sir Thomas Tindale shortly after 1539 on the site of a medieval manor dating back to 1275. It was originally in the same family for 250 years and has been refurbished by its current owners’, who live on-site, to ensure that each room is elegantly decorated to give a subtle, contemporary feel, whilst still maintaining the character of this beautiful building. This detached property has lots of space to relax in, both inside and out. The 50 private acres that surround the building are beautifully designed and maintained, and hold some hidden gems, including a large hot tub, sauna, a flood lit tennis court, a large barbeque, fire pit, a summer house gazebo and a croquet lawn, along with garden games. Inside you will also find a cellar bar that has been designed to evoke a 1920s ambiance, featuring soft lantern lights, a full bar, and stone infrastructure, along with an elegant dining room and living room, and a large well-equipped kitchen and gym. All but one of the sumptuous bedrooms enjoy their own private bathroom and every care has been taken by the owner’s to ensure that guests have a discrete, restful and enjoyable stay. Book Hockwold Hall and you will find every need catered for. This is the perfect opportunity to create memories that will truly last a life time. The shop is ½ mile from Hockwold Hall near Thetford, with the pub and restaurant 300 yards from Hockwold Hall. Living room: With wood burner and Bluetooth speaker (no TV). Kitchen/dining area: With wood burner, electric oven, electric hob, Aga, microwave, fridge/freezer, 2 freezers, wine cooler, 52 Freeview TV with Netflix and DVD player. Bedroom 1 (Thetford): With king-size bed, double bed and en-suite with shower over bath, and toilet. Bedroom 2 (Cromer): With 2 double beds and en-suite with shower over bath, and toilet. Bedroom 3 (Elveden): With double bed, twin beds and en-suite with shower over bath, and toilet. Bedroom 4 (Sandringham): With four poster king-size bed and en-suite with Jacuzzi bath, shower cubicle, toilet and heated towel rail (also accessed from landing). Bedroom 5 (Norwich): With four poster king-size bed and en-suite with shower over bath, and toilet. Bedroom 6 (Sheringham): With king-size bed and en-suite with shower cubicle and toilet. Bedroom 7 (Brandon): With four poster king-size bed and en-suite with shower over bath, and toilet. Bedroom 8 (Kings Lynn): With king-size bed and en-suite with shower over bath, and toilet. Bedroom 9: With double bed and twin bed. Oil central heating, electricity, bed linen, towels, Wi-Fi and logs for wood burners included. 5 highchairs. Welcome pack. 50-acre lawned garden with courtyard, sitting out area, garden furniture, summerhouse, firepit and gas barbecue. Garden games including volley ball and croquet. Hot tub for 12 (private). Sauna (private). Tennis court with flood lights (private). Bike store. Private parking for 20 cars. No smoking. Please note: This property has a natural water supply from a well. There is a pond in the grounds, 135 yards. Holidays at Hockwold Hall run from Friday to Friday. For a better idea of where Hockwold Hall is, you can see Hockwold Hall on the map below. Hockwold Hall is in Norfolk; should you be on the lookout for a special offer, you can find all the special offers in Norfolk. It's always worth checking to see what is on offer at the moment. Do you want to holiday near Hockwold Hall (UKC3401), you can see other cottages within 25 miles of Hockwold Hall; have a look to find your perfect holiday location.